• PLOT SUMMARY: "The Prince" Part 3 of 3 - Daken has proven himself capable of wearing many masks, but who's the real man underneath? As one of Norman Osborn's Avengers, he has it all: power, fame, access...but what if it's not enough? Could Wolverine's son have a heart after all-and if so, will it be the Fantastic Four who help him discover it? 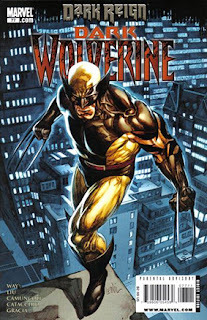 Or will they find themselves on the receiving end of a betrayal so huge it will put them at war with the Dark Avengers? Written by DANIEL WAY and MARJORIE LIU. Art by GIUSEPPE CAMUNCOLI. Cover by LEINIL FRANCIS YU.